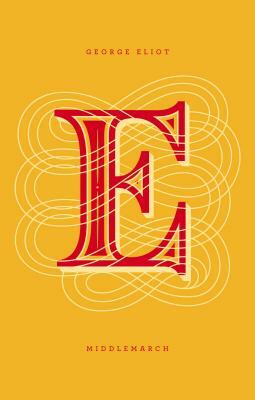 E is for Eliot. Considered one the masterpieces of realist fiction, George Eliot’s novel, Middlemarch: A Study of Provincial Life, explores a fictional nineteenth-century Midlands town in the midst of modern changes. The proposed Reform Bill promises political change; the building of railroads alters both the physical and cultural landscape; new scientific approaches to medicine incite public division; and scandal lurks behind respectability. The quiet drama of ordinary lives and flawed choices are played out in the complexly portrayed central characters of the novel—the idealistic Dorothea Brooke; the ambitious Dr. Lydgate; the spendthrift Fred Vincy; and the steadfast Mary Garth. The appearance of two outsiders further disrupts the town’s equilibrium—Will Ladislaw, the spirited nephew of Dorothea’s husband, the Rev. Edward Casaubon, and the sinister John Raffles, who threatens to expose the hidden past of one of the town’s elite. Middlemarch displays George Eliot’s clear-eyed yet humane understanding of characters caught up in the mysterious unfolding of self-knowledge. GEORGE ELIOT (Mary Ann Evans Cross) was born on November 22, 1819 at Arbury Farm, Warwickshire, England. She received an ordinary education and, upon leaving school at the age of sixteen, embarked on a program of independent study to further her intellectual growth. In 1841 she moved with her father to Coventry, where the influences of “skeptics and rationalists” swayed her from an intense religious devoutness to an eventual break with the church. The death of her father in 1849 left her with a small legacy and the freedom to pursue her literary inclinations. In 1851 she became the assistant editor of the Westminster Review, a position she held for three years. In 1854 came the fated meeting with George Henry Lewes, the gifted editor of The Leader, who was to become her adviser and companion for the next twenty-four years. Her first book, Scenes of a Clerical Life (1858), was followed by Adam Bede (1859), The Mill on the Floss (1860), Silas Marner (1861), and Middlemarch (1872). The death of Lewes, in 1878, left her stricken and lonely. On May 6, 1880, she married John Cross, a friend of long standing, and after a brief illness she died on December 22 of that year, in London. JESSICA HISCHE is a letterer, illustrator, typographer, and web designer. She currently serves on the Type Directors Club board of directors, has been named a Forbes Magazine “30 under 30” in art and design as well as an ADC Young Gun and one of Print Magazine’s “New Visual Artists”. She has designed for Wes Anderson, McSweeney’s, Tiffany & Co, Penguin Books and many others. She resides primarily in San Francisco, occasionally in Brooklyn.